Is he who was beloved more than all of the disciples. On the twenty sixth the child of thunder departed unto God. 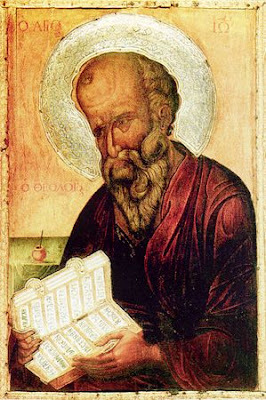 The holy Apostle and Evangelist John the Theologian was the son of Zebedee and Salome, the daughter of Joseph the Betrothed, and he was called away from his fisherman’s nets to preach the Gospel. 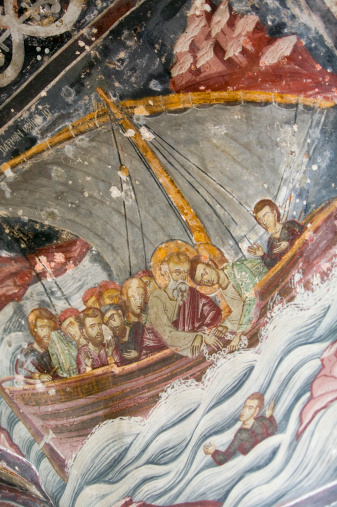 When our Lord Jesus Christ, walking along the Sea of Galilee, chose His apostles from amongst the fishermen and had already summoned the two brethren, Peter and Andrew, He then caught sight of two other brothers, James and John, sons of Zebedee, who were mending their nets in a boat with their father, and called them. Straightway, abandoning their boat and their father, they followed after Jesus Christ. At the very time of his calling, John was called “son of thunder” by the Lord, for his theology would be heard like thunder throughout the world and would fill the whole earth. John followed after his blessed Teacher, learning the wisdom that proceeded from His lips; and he was well-loved of Christ his Lord for his complete lack of guile and his virginal purity. The Lord honored him as the fairest of the twelve apostles, and he was one of the three of Christ’s closest disciples, to whom the Lord revealed His divine mysteries many times. Thus, when He intended to raise up the daughter of Jairus, He permitted none to accompany Him, save Peter, James and John. When He prayed in the garden, there also He was not without John, for He said to the disciples: “'Sit here, while I go and pray yonder.' And He took with Him Peter and the two sons of Zebedee” (Mt. 26:36-37), i.e., James and John. When He desired to show forth the glory of His divinity on Mt. Tabor, He likewise took only Peter, James and John. As the beloved disciple of the Master, John was never separated from Christ. And Christ’s great love for him is evident in the fact that John rested his head upon His breast. For, at the Mystical Supper, when the Lord foretold His betrayal and the disciples began to look at each other in bewilderment, wondering of whom he spoke; then John rested his head upon the breast of His beloved Master, as he himself relates in his Gospel: “Now there was leaning on Jesus’ bosom one of His disciples, whom Jesus loved. Simon Peter, therefore, beckoned to him, that he should ask who it should be of whom He spake. He then, lying on Jesus’ breast, saith unto Him: ‘Lord, who is it?’” (Jn. 13:23-25). The Lord so loved John that only he was able freely to rest his head upon the Lord’s breast and to ask Him boldly of this secret. John also showed a mutual love for his beloved Teacher, greater than that of the other apostles, for at the time of Christ’s voluntary suffering they all fled, forsaking their Shepherd, and he alone remained to gaze upon all the torments of Christ, suffering with Him in his heart, weeping and lamenting with the all pure Virgin Mary, the Mother of the Lord, and with her did not leave the side of the Son of God Who suffered for us, until the Savior’s death upon the cross. For this cause he was given by the Lord as son to the all pure Virgin Mary: “When Jesus, therefore, saw His mother, and the disciple standing by, whom He loved, He saith unto His mother: ‘Woman, behold thy son!’ Then saith He to the disciple: ‘Behold thy mother!’ And from that hour that disciple took her unto his own home” (Jn. 19:26-27). And he regarded her as his own mother, and served her with much respect until her honored and glorious repose. On the day of her repose, when they took up her precious and holy body to bury it, St. John went before her bier with a royal scepter which shone with light, which the Archangel Gabriel had given the all pure Virgin, announcing her translation from earth to heaven. After the repose of the all holy Theotokos, St. John, accompanied by his disciple Prochorus, departed for Asia Minor, where it was his lot to preach the Word of God. While travelling thereto, St. John was troubled, for he foresaw perils upon the sea and told his disciple about them beforehand. It happened that when they took ship in Joppa and began to sail, a great tempest arose at the eleventh hour of the day, and at night the ship foundered, and all thereon were cast into the waves of the sea, catching hold of whatever they were able. At the sixth hour of the day the sea cast all of them, Prochorus not excepted, upon the shore about a mile from Seleucia. Only John remained in the sea. Long and hard did Prochorus lament and he went on to Asia alone. On the fourteenth day of his journey, he arrived at a certain village which lay nigh unto the sea, and remained there to rest. One day, as he walked along the shore and yearned for John, a wave broke upon the shore with a great noise and cast forth John, alive. Prochorus approached to see whom the sea had surrendered, and seeing that it was John, he lifted him from the ground and, embracing each other, they wept and gave thanks to God for all things. Thus did St. John spend fourteen days and nights in the sea, yet, by the grace of God, remained alive. Entering the village, they asked for some bread and water and, having strengthened themselves, set forth for Ephesus. On entering Ephesus together, they met a woman by the name of Romana (the report of whose infamy had reached even Rome), who operated a public bath in that city. Hiring John and Prochorus, she put them to work in the bath and tormented them. With deceit she drew them into her service: she put John to work maintaining the fire, and Prochorus to pour the water, both for the remainder of their lives, and they remained in such misfortune for some time. There lived in the bath a certain demon who yearly slew one of them that bathed therein — either a young man or a virgin, the murders continued for many years. Once, it happened that a youth named Domnus, the son of the high civil official Dioscorides, entered the bath. As Domnus washed himself, the demon fell upon him and strangled him; and there was great lamentation for him. This became known throughout the whole city of Ephesus; and Dioscorides himself, when he was informed thereof, was so grieved that he died of sorrow. Romana prayed long to Artemis to raise Domnus from the dead, and, praying, abused her own body, but all was of no avail. John asked Prochorus of what had happened, and Romana, seeing them conversing together, laid hold of John and began to rain blows upon him, reproaching and blaming him for the death of Domnus. At last, she said: “If thou dost not raise Domnus from the dead, I shall slay thee!” Having prayed, John raised up the young man. Romana was terrified. She called John a god or the son of a god, but he proclaimed the power of Christ and exhorted her to believe in Him. Afterwards, he raised Dioscorides as well, and both he and his son believed in Christ and were baptized. Great fear fell upon all the people, and they were astounded by what had taken place. Some said that John and Prochorus were sorcerers, others noted correctly that magicians cannot raise the dead. John drove the demon from the bath and dwelt with Prochorus in the house of Dioscorides, confirming the newly enlightened ones in the faith and teaching them a virtuous life. Once, there was held in Ephesus a festival of Artemis, and all the people celebrated in white garments, rejoicing and making merry in the temple of Artemis. Across from the temple stood an idol of that goddess. And lo, John, ascending a high place, stood near the idol and loudly denounced the blindness of the pagans, that they were not even aware of whom they were worshipping, honoring a demon as God. But the people were filled with wrath at this and cast stones at John, yet not one of the stones hit its mark, for the stones turned and hit them that had cast them. Raising his hands to heaven, John began to pray, and straightway fire and great heat broke out upon the ground and consumed a multitude of two hundred people, and all died. The rest approached John in fear, and besought him for mercy, for terror and trembling had fallen upon them. When John had prayed, all the dead arose and did homage to him; and having believed in Christ, they were baptized. There, in a certain place called Tikhos, John healed a man who had lain paralyzed for twelve years. The man he had cured glorified God. And saying this, the demon displayed a warrant testifying to what he had related; he also brought forth a pouch of gold, promising to give it to anyone who would kill the sorcerers. 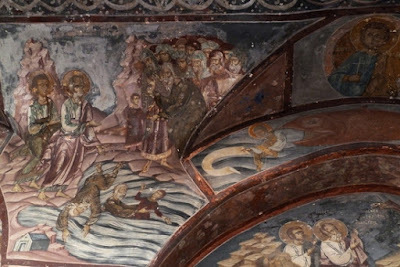 On hearing this, several soldiers took pity on him, incited the people against John and Prochorus and, descending upon the house of Dioscorides, said: “Either surrender the wizards to us, or we shall burn down thy house!” Dioscorides quickly assented to have his house burned rather than surrender the apostle and his disciple Prochorus to them. But John, foreseeing in the spirit that the people’s revolt would lead to good, gave himself and Prochorus over to the mob. Led by the people, they reached the temple of Artemis. John prayed to God, and suddenly the idolic temple collapsed, and not one person within survived. The apostle said to the demon sitting there: “I say unto thee, O impure demon, tell us how many years thou hast lived here, and whether it is thou that hast incited these people against us!” The demon answered: “I have dwelt here for one hundred and nine years, and it is I that have incited the people against you.” John said unto him: “In the name of Jesus of Nazareth I command thee to leave this place.” Straightway the demon departed. Terror seized all the people, and they believed in Christ. Yet greater signs were wrought by John, and a vast multitude of the populace turned to the Lord. Taking hold of John and Prochorus, the soldiers led them to a ship and set sail. One day, as they were sailing, the emperor’s aides sat down to dine and, having a great amount of food and drink, made merry. One of them, a young man, fell into the sea while playing and drowned. Then their joy and gladness turned to weeping and lamentation, for they were not able to help the one who had fallen into the depths of the sea. The father of that youth mourned with especial fervor, for he, too, was aboard the ship; he wished to cast himself into the sea, but was restrained by the others. Knowing John’s ability to perform miracles, they all began to entreat him earnestly for his help. He asked each of them whom they honored as god: one said Apollo; another, Zeus; a third, Hercules; others, Aesculapius; yet others, Artemis of Ephesus. John said unto them: “How many gods ye have, and yet are not able to save one drowned man!” He left them in their grief until morning. In the morning, John took pity on the death of the youth and earnestly prayed to God with tears. Straightway, a turbulence erupted on the sea, and one wave, breaking over the ship, cast the young man alive at John’s feet. Seeing this, all were amazed and rejoiced over the youth that had been saved from drowning. Then they began to honor John and removed his iron shackles. Once, at the fifth hour of the night, a great storm arose upon the sea, and all began to cry out, despairing for their lives, for the ship had already begun to break asunder. Then all cried to John, begging him to help them and entreat his God to save them from destruction. Commanding them to silence, the holy one began to pray, and the storm ceased immediately and a great calm reigned. One soldier was in the throes of a stomach disease and had already died, but the apostle restored him to life and made him well. Water grew scarce on the ship, and many, growing faint from thirst, were near death. John said to Prochorus: “Fill the vessels with seawater.” When the vessels were filled, he said: “In the name of Jesus Christ, take ye and drink. And drawing forth the water, they found it sweet, and drinking it they were refreshed. Beholding such wonders, John’s fellow travelers received baptism and desired to set him free. But he himself persuaded them to convey him to the place appointed for him. Arriving at the island of Patmos, they presented a letter to the governor. Myron, the governor’s father-in-law, took John and Prochorus to his home. Myron had an elder son by the name of Apollonides, who was possessed by a prophetic spirit which foretold the future; all considered Apollonides a prophet. No sooner did John enter the house of Myron than Apollonides immediately fell dumb; he fled to another city, fearing lest the prophetic spirit be driven from him by John. When a cry went up in the house of Myron for Apollonides, a message arrived from him stating that John had driven him from his house by his sorcery, and that he would not be able to return until such time as John be destroyed. On hearing this, all fell at John’s feet. He, opening his lips, taught them to believe in our Lord Jesus Christ. Myron believed, and his wife and children, and were all baptized, and there was great joy in the house of Myron. Afterwards the governor’s wife Chrisippida, Myron’s daughter, and her sons and all her slaves received holy baptism. After her, her husband Laurence was baptized. He then set aside all his authority as governor of that island to be able more freely to serve God. John and Prochorus remained three years at the house of Myron, preaching the word of God. There he wrought many signs and wonders through the power of Jesus Christ: he healed the sick and cast out demons, destroyed the temple of Apollo with all its idols by his word alone, and baptized many that he had brought to believe in Christ. John commanded the demons who were standing there in human form, not to leave. He prayed to the Lord that Kynops not be alive, and it was so; for the sea suddenly was troubled and boiled with waves, and Kynops did not leave the sea but remained in the depths, like wretched Pharaoh of old. To the demons, whom the crowd considered men raised from the dead, John said: “In the name of Jesus Christ, Who was crucified and rose again on the third day, depart from this island.” And they straightway vanished. The people sat on the sand, waiting for Kynops for three days and three nights; from hunger, thirst, and the burning sun many of them grew faint and lay in silence. Three of their children died. Taking pity on the people, John prayed for their salvation, and speaking much with them concerning the faith, he raised up their children and healed the sick. All of them with one soul turned to the Lord, were baptized and returned to their homes, glorifying Christ. John went back to the house of Myron and, going oft to the people, taught them to believe in Jesus Christ. One day he found a sick man lying by the road, suffering mightily of a fever, and he healed him with the sign of the Cross. 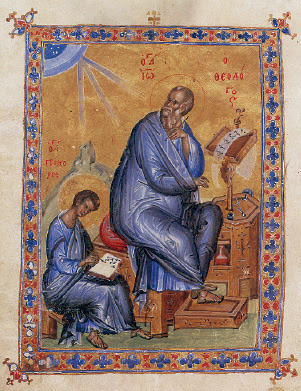 A certain Jew named Philo, who argued with the apostle over the Scriptures, seeing this, asked John to his home. His wife was afflicted with leprosy; but when she fell at the apostle’s feet, she was immediately cured of leprosy and believed in Christ. Then Philo himself believed, and with his whole household received holy baptism. Later, John went to the marketplace, and the people gathered around to hear the teaching of salvation from his lips. There also came pagan priests, of whom one, testing the saint, said: “Master, I have a son who is lame in both legs. I beg thee: heal him. If thou healest him, I shall believe in the God Whom thou dost preach.” The saint said to him: “Why testest thou God, Who clearly showeth the wickedness of thy heart?” Saying this, John sent to the man’s son such words: “In the name of Christ my God, arise and come to me.” And he, immediately rising up, came to the saint healthy; but at that moment his father went lame in both legs because of his testing, and fell to the ground with a cry because of the great pain, begging the saint: “Have mercy on me, O priest of God, and heal me with the name of Christ thy God, for I believe that there is no other God than Him.” Moved by his entreaties, the saint healed the priest, and instructing him in the faith, baptized him in the name of Jesus Christ. In the morning John went to the place where a man lay who had suffered of dropsy and had not risen from his bed for seventeen years. The apostle healed him with his word and enlightened him with holy baptism. On the same day, John was sent for by the man who had become governor after Myron’s son-in-law, Lawrence, earnestly begging the saint to come to his home; for it came time for the governor’s wife, who was in labor, to give birth, and she had suffered much, not having the strength to deliver. The apostle went quickly and as soon as he crossed the threshold of the house, the woman immediately gave birth and was relieved of her pain. Seeing this, the governor believed in Christ with all his household. John waited for the moment when the god left the swamp; and lo, about the fourth hour of the day a demon appeared, coming forth from the water in the form of a huge wolf. Halting him with the name of Christ, St. John asked: “How many years hast thou dwelt here?” “Seventy years,” replied the demon. The apostle of Christ said: “In the name of the Father, and of the Son, and of the Holy Spirit, I command thee to depart from this island, never again to return.” The demon immediately vanished. The man, seeing what had happened, was terrified and fell at the apostle’s feet. John taught him the holy faith, and said to him: “Behold, thou hast from me that pearl which I promised to give thee.” Meanwhile, there came to that place with the young men in bonds, priests with knives in their hands, and with them many people. Long did they await the moment when the wolf was to leave the swamp, in order to offer the youths as food for him. At length, John approached them and began to ask them to release the innocent young men: “Your wolf god is no more,” he said. “He was a demon, and the power of Christ conquered him and put him to flight.” Hearing that the wolf had perished, they were afraid and, not finding him despite long searching, they released the young men, and they went away unharmed. St. John began to preach to them of Christ and denounced their delusion, and many of them, believing, were baptized. Reasoning that a demon resided in the bath, the saint called him forth and asked: “Who art thou and why dost thou live here?” “I am the demon thou didst cast out of the bath in Ephesus, and I have lived here for six years, working harm to the people.” St. John drove him from that place as well. Seeing this, the priest believed in Christ and was baptized with his son and with his whole household. After this John went to the market place where almost all the city had assembled to hear the word of God. And lo, a certain woman fell at his feet, beseeching him with tears to heal her possessed son, for whose cure she had given physicians almost all her possessions. The apostle commanded that the child be brought to him, and as soon as the messengers said to the possessed one, “John calleth thee,” the demon immediately left him. Approaching the apostle, the cured man confessed his faith in Christ and was baptized, together with his mother. In the same city there was an especially revered temple with an idol of the god Bacchus, who was known amongst the idolators as the “father of freedom.” Celebrating his feast there with food and drink, men and women made merry and, becoming inebriated, performed great iniquities in honor of the abominable god. Arriving there during the feast, John denounced them for their lewd festivity; and the priests, of whom there was a multitude, laying hold of him, beat him and cast him out bound; and they themselves returned to their foul deeds. St. John prayed to God that He not permit such iniquity, and straightway the pagan temple was cast down to its foundation and killed all the priests; the rest of the people, horrified, freed the apostle from his bonds and besought him not to slay them. In the morning, John again instructed the people to believe in Christ, and many of them, believing, asked John to baptize them. When John took them to the river, Nucianus turned the water into blood with his sorcery. The apostle blinded Nucianus with his prayer, and making the water pure again, baptized all that believed therein. Impelled by this, Nucianus came to his senses and, sincerely repenting, asked the apostle to take pity on him. The saint, seeing his repentance, instructed him well and baptized him — and he straightway regained his sight and led John to his own home. When John entered therein, immediately all the idols in Nucianus’ home fell and crumbled to dust. Seeing this wonder, his household servants were affrighted and, believing, were baptized. There was in that city a certain rich and beautiful widow by the name of Procliania. She had a son named Sosipater who was comely of appearance, and she, at the instigation of the demons, became inflamed with lust for him, and strove in every way to lure him into her iniquity. But her son hated his mother for her insane passion. Fleeing from her, he came to the place where John was teaching at that time, and listened to the apostle’s instruction with delight. John, to whom the Holy Spirit had revealed all that had happened to Sosipater, met him alone and instructed him to honor his mother but not to obey her in this iniquitous deed and to speak to no one about this, so as to conceal the sins of his mother. Sosipater did not want to return to his mother’s house, but Procliania, encountering him, laid hold of his garments and dragged him home shouting. The governor who had not long before arrived in that city responded to this cry, and asked why the woman was dragging the youth so. The mother, concealing her foul purpose, slandered her son, implying that he desired to take her by force; and she ripped out her hair with weeping and crying. On hearing this, the governor believed the lie and condemned the innocent Sosipater to be sewn into a leather sack with poisonous serpents and cast into the sea. Learning of this, John appeared before the governor, denouncing him for his unjust verdict, and that, not determining the guilt of Sosipater as is required, he condemned the guiltless youth to death. Procliania uttered calumny against John also, saying that he was the charlatan who had taught her son such evil. On hearing this, the governor commanded that the holy apostle also be drowned, sewn into the same sack as Sosipater, with divers adders. The saint prayed and suddenly the earth quaked, and the hand of the governor, by which he had signed the sentence against the saint, withered; and both of Procliania’s arms withered, and her eyes became distorted. Seeing this, the judge was terrified, and all that were there fell down out of fear. The judge begged John to take pity on him and heal his withered arm; the saint, having instructed him much in righteous judgment and in faith in Christ, healed him and baptized him in the name of the Father, and of the Son, and of the Holy Spirit. 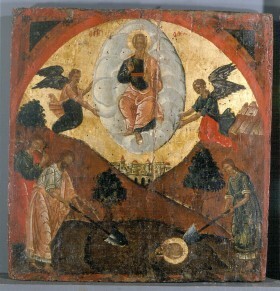 Thus was the innocent Sosipater delivered from temptation and death, and the judge acknowledged the true God. But Procliania fled from her child to her home, carrying with her the punishment of God. The apostle, taking Sosipater, went after her. 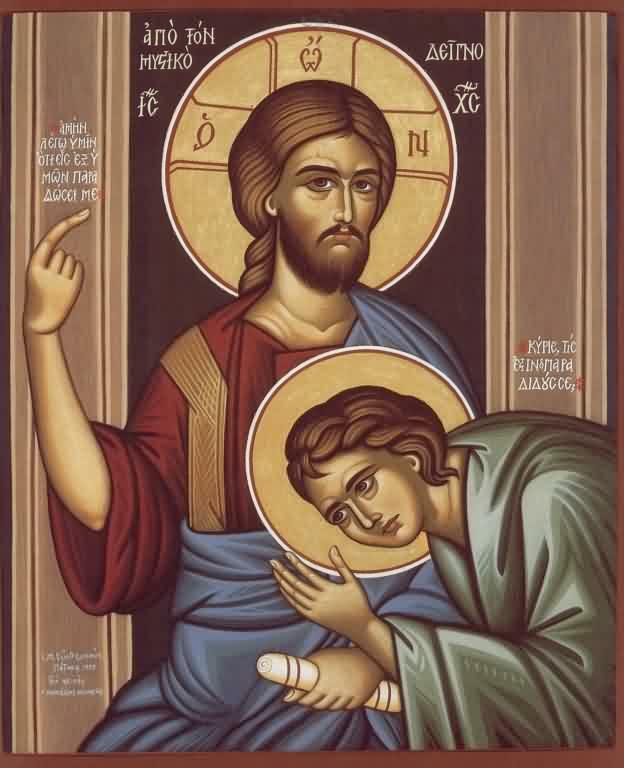 Sosipater did not wish to go to his mother, but John instructed him in meekness, believing that he would thereafter hear nothing evil from his mother, for she had been made chaste. Thus it was in fact. For when John and Sosipater entered her house, Procliania straightway fell at the apostle’s feet, acknowledging her sins in tears, and repenting. Healing her of her afflictions and teaching her the faith and chastity, the apostle baptized her and all her household. And so, having become chaste, Procliania spent her days in great penitence. Lifting up his eyes to Heaven, he began to pray again. After he had finished, he began to speak: “In the beginning was the Word... ”, and the rest. His disciple attentively recorded all that he heard from his lips. Thus was written the holy Gospel which the apostle, descending the mountain, commanded Prochorus to transcribe once more. He agreed to leave a copy in Patmos for the Christians, in accordance with their request; but the original copy he kept with himself. On the same island St. John wrote also the Apocalypse. 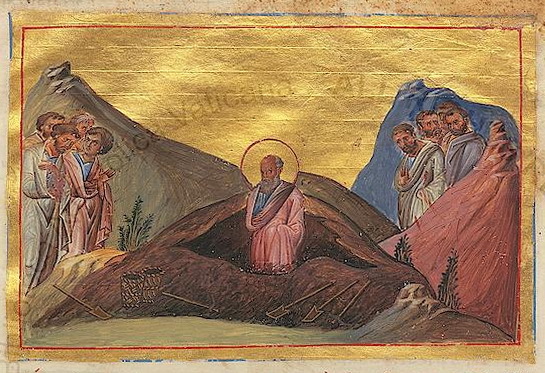 Tradition relates that one day John and his disciple Prochorus departed from the city to a cave in the wilderness, where he spent ten days with Prochorus and another ten days alone. These latter ten days he ate nothing, but only prayed to God, entreating Him to reveal what he should do. A voice came to John from on high, saying: “John, John!” John answered: “What dost Thou command, Lord?” The voice from on high said: “Wait ten days, and thou shalt receive a revelation of much that is great.” John remained there ten more days without food. Then something marvellous occurred: the angels of God came down to him and proclaimed much that was ineffable. When Prochorus returned, he sent him back for ink and paper, and for two days thereafter he spoke to Prochorus of the revelations he had received, and his disciple wrote them down. 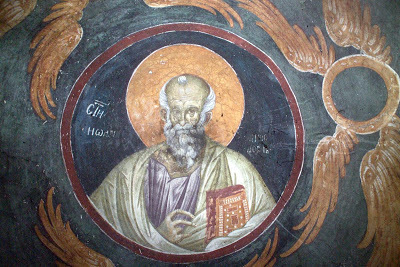 Before his departure from the island, John went around the outlying cities and villages, confirming the brethren in the faith; and it happened that he was in a certain village in which there lived a priest of Zeus, by the name of Eucharis, who had a blind son. That priest had long desired to see John, and hearing that the apostle was abiding in his village, he went to the saint, beseeching him to come to his house and to heal his son. John, seeing that he would acquire some souls for Christ, went to the priest’s house and said to his blind son: “In the name of my Lord Jesus Christ, see.” And the boy immediately recovered his sight. On beholding this, Eucharis believed in Christ and was baptized with his son. In all the towns of that island John founded holy churches and appointed bishops and priests for them; and having instructed the people sufficiently, he took leave of them all and began his return to Ephesus. The believers escorted him with weeping and great lamentation, not wishing to be parted from such a sun, by whose teaching their land had been illuminated; but the saint, boarding the ship and bestowing his peace upon all, went on his way. When he had reached Ephesus, the faithful met him with inexpressible joy, crying out, and saying: “Blessed is he that cometh in the name of the Lord!” And he was received with honor. Abiding there, he ceased not to labor, ever teaching the people and guiding them on the path of salvation. When John came to the robbers, he asked them to lead him to their leader, which they did. The youth, seeing St. John, was ashamed, and rising up, fled into the desert. Heedless of his age, John pursued him, crying out: “My son, return to thy father and despair not in thy fallen state! Thy sins shall I take upon myself! Stop and wait, for the Lord has sent me to thee!” Halting in his flight, the young man fell at the saint’s feet with trembling, greatly ashamed, not daring to raise his eyes to John’s face. But John, embracing him with paternal love, kissed him and led him back to the city, rejoicing that he had found the lost sheep. He taught him much, instructing him in repentance, in which the youth earnestly struggled to please God, and thus received forgiveness of sins and reposed in peace. There was at that time a certain Christian who had fallen into penury, and he had naught with which to pay back his creditors; in great distress he thought to kill himself and asked a certain sorcerer, a Jew, to give him some deadly poison. That enemy of Christians and friend of demons carried out the request and gave him a fatal potion. Taking the potion, the Christian returned to his home, but long he considered and was afraid, not knowing what to do. Finally, making the sign of the Cross over the cup, he drank it and felt not the least harm therefrom, for the sign of the Cross had taken all the poison from the cup. He marvelled much that he remained healthy and felt no ill effects. But again, not able to escape his creditors, he went to the Jew and asked him to give him some stronger poison. Astounded that the man was still alive, the sorcerer have him a stronger potion. Taking the poison, the man again went to his home. After long debating whether to drink, he made the sign of the Cross over the cup as before and drank thereof; but again he suffered not at all. Once more he went to the Jew and appeared to him healthy. He mocked the sorcerer, saying that he was incompetent in his wizardry. The Jew, startled, asked him what he had done, how he had drunk the potion. He replied: “Nought else but to make the sign of the Cross over the cup.” The Jew perceived that the sign of the holy Cross had prevented the man’s death; and desiring to know the truth, he gave some of the poison to a dog; and immediately the dog fell dead. Seeing this, the Jew went with the Christian to the apostle and described what had happened with them. St. John taught the Jew to believe in Christ and baptized him; and the poor Christian he commanded to bring an armful of hay, which he turned into gold by the sign of the cross and prayer, that he could then pay his debts, and with the remainder maintain his home. Afterwards, the apostle again returned to Ephesus where, abiding in the house of Domnus, he converted a great multitude of people to Christ and performed untold wonders. He kissed his disciples and they covered him to the knees, and when he had again kissed them, they covered him to his neck, leaving his face uncovered. Once again they kissed him, and with great weeping covered him entirely. Hearing of this, the brethren came from the city and dug up the grave, but they found nothing there and wept greatly; then, having prayed, they returned to the city. Each year, on the eighth day of May, a fragrant myrrh comes from the grave and, at the prayers of the holy apostle, the sick are healed thereby, to the honor of God Who is glorified in the Trinity unto the ages of ages. Amen. From Orthodox Life, Volume 30, No. 3, May June 1980, published by Holy Trinity Monastery, Jordanville, New York. Apostle beloved of Christ our God, hasten to deliver a defenceless people. He Who allowed thee to recline on His breast, receives thee bowing in prayer, O John the Theologian. Implore Him to dispel heathen persistance, and to grant us peace and mercy. Who can tell of thy mighty works, O beloved Saint? Thou didst pour forth miracles. Thou art a source of healing and dost intercede for our souls, as a Theologian and friend of Christ. To learn wholly the high secrets of heaven, to investigate the depths of the sea is rash and beyond comprehension; as therefore it is wholly impossible to number all the stars and the sand on the sea shore, so it is to tell the graces of the Theologian, with so many crowns Christ has garlanded the one he loved; the one who leant on his breast and feasted with him at the secret supper, as a Theologian and friend of Christ.